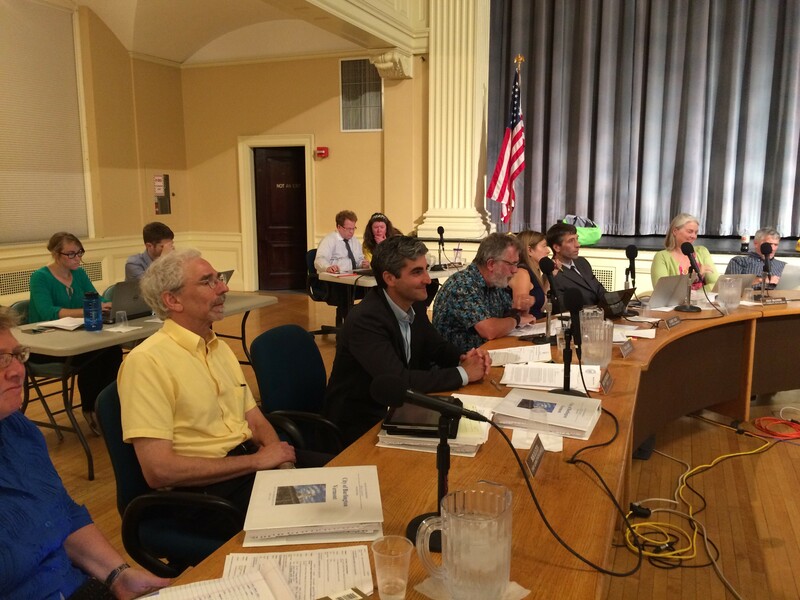 Chief administrative officer Bob Rusten, far left, sits next to Mayor Miro Weinberger at Monday's council meeting. Burlington city councilors on Monday night performed what several of them described as their most important duty: voting on Mayor Miro Weinberger's budget proposal. Only four members of the public, plus three reporters, came out to see the action. The budget sets aside more money for infrastructure improvements, such as sidewalk and bike path renovations, and repairs to city-owned buildings. It also includes additional funding for the police department, allowing it to maintain a force of 100 officers while funding other positions such as a data analyst who will examine opiate-related issues. And it funds a new community center to be located in what was Saint Joseph School in the Old North End. Councilor Karen Paul summarized the budget for the meager audience, praising the administration for continuing to build up the city's cash reserves and calling the final product a "testament to the collaborative process we have embarked on." Councilors, who have been reviewing the budget for several weeks, had largely worked through differences over the mayor's proposal by Monday night. Council President Jane Knodell, a Progressive, succeeded in convincing the administration to reduce the tax rate by a full penny, whereas the initial proposal would have reduced it by a half cent. The only notable point of contention came when Councilor Sharon Bushor offered an amendment over her concern about one source of revenue: fees garnered from raising parking rates and extending the hours of enforcement in one section of downtown Burlington. The independent councilor's amendment passed, 7-5, over the objections of the mayor, and with the Democratic members of the council voting against it. It won't alter anything in the budget; it simply allows Bushor and others to register their concern.